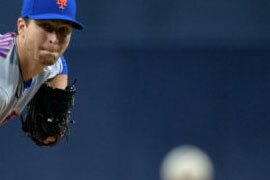 Game after game all summer, Jacob deGrom ’10 shined brightly, even while playing for a team that mostly was struggling. DeGrom was great; his New York Mets weren’t. On Nov. 14, Major League Baseball presented the former Hatter star with a pitcher’s ultimate reward: the Cy Young Award for the National League. In turn, Stetson Baseball made history — becoming the first college program to produce Cy Young Award winners in consecutive years. Corey Kluber ’07 was the American League winner a year ago. By the way, Kluber finished third in this year’s American League voting, following another superb season with the Cleveland Indians. The lanky right-hander’s performances, time and time again, were that individually special and overwhelmingly. DeGrom’s 1.7 runs allowed per nine innings pitched were historically low. The 30-year-old finished the season with a Major League-best 1.70 ERA — an average of 1.7 runs allowed per nine innings pitched. That’s the sixth-lowest by a starting pitcher in the major leagues since 1969, when the mound was lowered in an effort to generate more offense. He amassed 269 strikeouts in 217 innings. Further, deGrom had 29 consecutive starts in which he surrendered three runs or fewer, setting an all-time record. Also, he allowed the fewest home runs per nine innings in the National League. 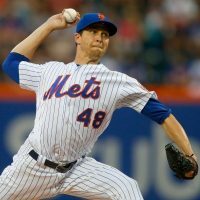 Finally, deGrom became the seventh pitcher to win both the National League Rookie of the Year (in 2014) and the Cy Young Award. For good measure, on the day following the Cy Young Award announcement, deGrom received a first-place vote for National League Most Valuable Player. And imagine this: At Stetson, deGrom primarily played shortstop and initially was reluctant to take the mound, as reported in this Newsday article.